The Department of Corrections is the largest mental health care provider in the state, and the administrators at Spring Creek Correctional Center want to make it one of the most effective, too. 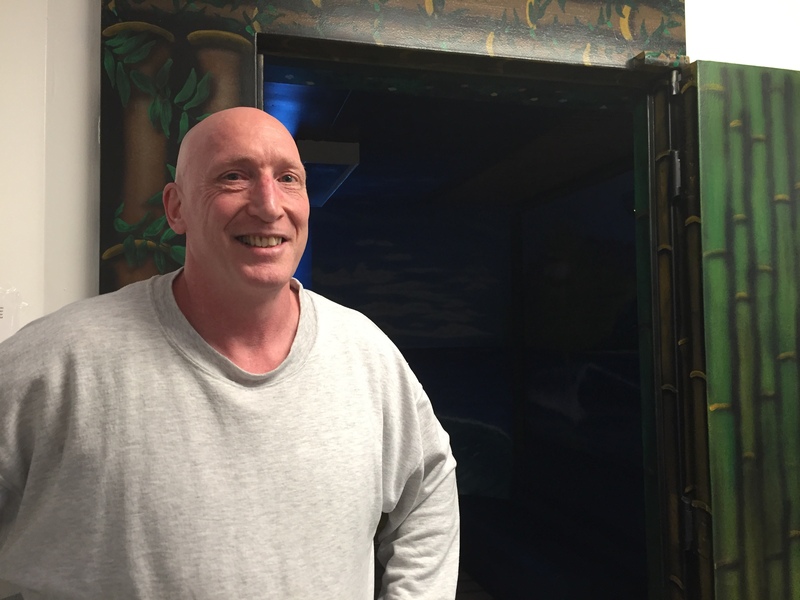 They’re treating inmates who have mental illnesses with new innovations — porches and paintings. During his three years at Spring Creek, inmate Kaleb Summitt has been in and out of segregation because of fighting. “And now I’ve been out of seg for seven months. My new record!” he said excitedly one afternoon. Summitt said it used to be really hard to rejoin the prison community every time he left segregation, where he was locked in a cell for 23 hours per day. “Cause you’re locked down and you’re nervous being around people,” he said. Interacting with other people was already a challenge because he has bipolar schizoaffective disorder and his medications weren’t adjusted correctly. But this time when he left, instead of going straight from segregation to open housing, called a mod, he first transitioned to a room with an indoor “porch” in the mental health mod. In Spring Creek, the cells line the edges of one main room. 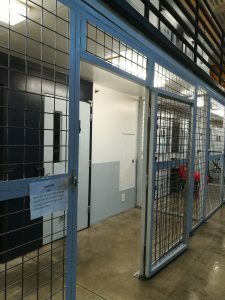 The porches are like large cages around the doors of the cells. 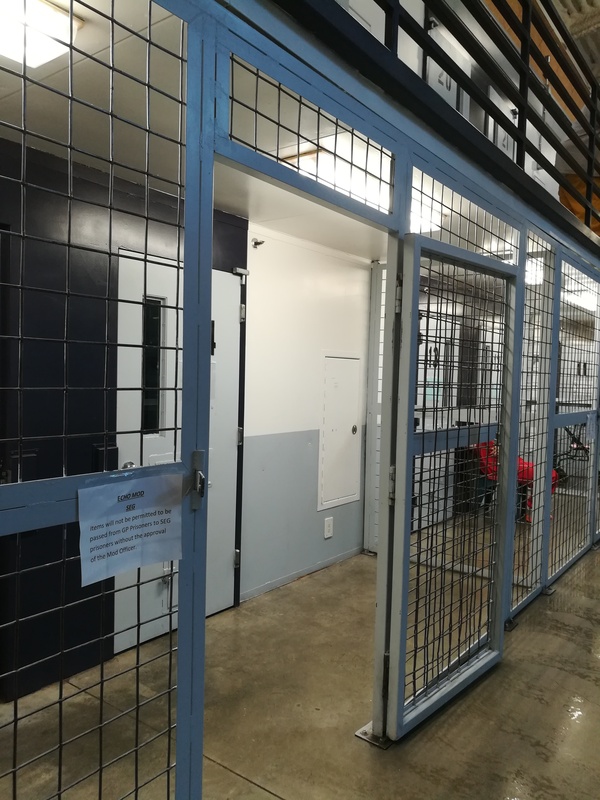 They provide a space for inmates to leave their rooms, walk around, and talk to people, but they can’t just wander freely in the communal area or have much physical interaction. Inmates are allowed out of their cells and onto the porches for at least three hours a day and eventually more. It also gave him the chance to talk to the mental health mod mentors. The mentors are inmates from the general population who live in the mental health mod and are paid to provide guidance and support. It’s a pilot program for Spring Creek. Originally three people filled the role, but two were dismissed because they caused problems. 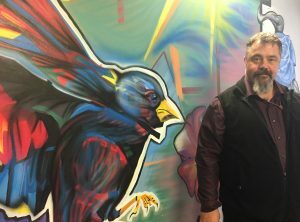 One mentor, Kent Matte said he understands what people leaving segregation are going through – he once spent three years in solitary confinement. Every time he left his cell he was fully restrained with two guards. “I’m an outgoing person and it affected me enough to where I thought I was starting to get a little crazy in my head,” he recalled. When Matte speaks with people on their porches and other inmates in the mod, he tries to be a role model and help them learn to trust people. Summitt said it helps him to talk to Matte. He tells Matte about problems that he doesn’t feel comfortable reporting to staff. But sometimes just chatting with Matte or even the mental health counselors isn’t enough to calm him down. Then he turns to another innovation at the prison – the Oasis. The Oasis is a regular cell with no bunks or toilet. The walls are painted with brightly colored murals of beach scenes. Waves lap onto sandy shores next to dense, flower-filled bamboo forests. Inmates can take a sound machine with them and sit on soft couches. Superintendent Bill Lapinskas decided to create the Oasis as an experiment. The institution didn’t have money to do anything fancy but he wanted to have a place where prisoners could just be people for a while. A team of inmate artists worked together to paint the room. A similar project is being tested for inmates in segregation at the Anchorage Correctional Complex, but it includes a large screen TV showing nature videos in a room painted green. 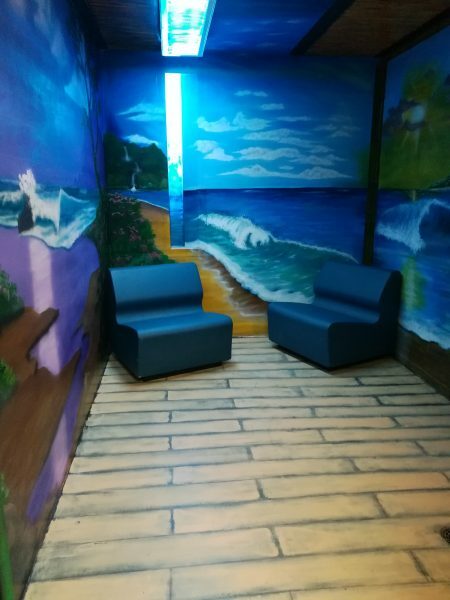 Spring Creek Inmates have painted murals in other parts of the prison as well, making some areas look like living rooms or storefronts. The intake area for seg has a large painting of a bird and flower that helps calm people down. The porches, the paintings, and the mentors are all part of Lapinskas’ larger mission for Spring Creek: to imbue the institution with more humanity and try to help the inmates, not just punish them. Have ideas to share? Text ‘hello’ to 907-885-6055 and join the conversation.